If you have many staff or host a lot of servers at your business then having fast internet can help you improve productivity and also expand your remote access capabilities. If your business has multiple physical locations, you’ll need a VPN. A virtual private network (VPN) allows you to link multiple sites by creating a secure tunnel through the public internet. 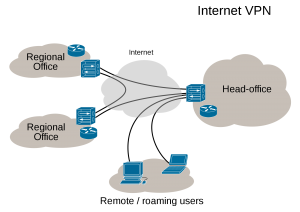 With a VPN, staff in a branch office can access systems in the main office, and vice-versa. We partner with Exetel to deliver managed site-to-site connections for customers across Australia. Filtering internet access in your organisation helps to keep the team focussed, productive and safe from online threats. Internet filtering can also speed up existing connections by preventing bandwidth being wasted on frivolous sites like YouTube and Facebook. Click here to find our more about internet filtering for your organisation. Dealing with spam yourself is a waste of time, ABTechnologies cloud spam filter can can significantly reduce spam before it even gets to your server. Less load on your server, less wasted bandwidth of your internet connection. Click here to find out more about spam filtering for your organisation. ABTechnologies partners with a select few providers to deliver internet connections and related services to our clients. We are confident in their capabilities because we use them ourselves in-house, and have many customers across the country who use them. Our goal is to ensure your business is always open. At ABTechnologies we can supply a range of products that can provide a fail over connection and increased bandwidth in the same solution. Whether it is an optical fibre and a 4G dongle connection, we can combine these to provide a robust solution to ensure business continuity while increasing up and download speeds. In the event of a loss of connectivity on one link, the secondary link automatically establishes network connectivity. This reduces potential down time that results in productivity loss and trading disruption.